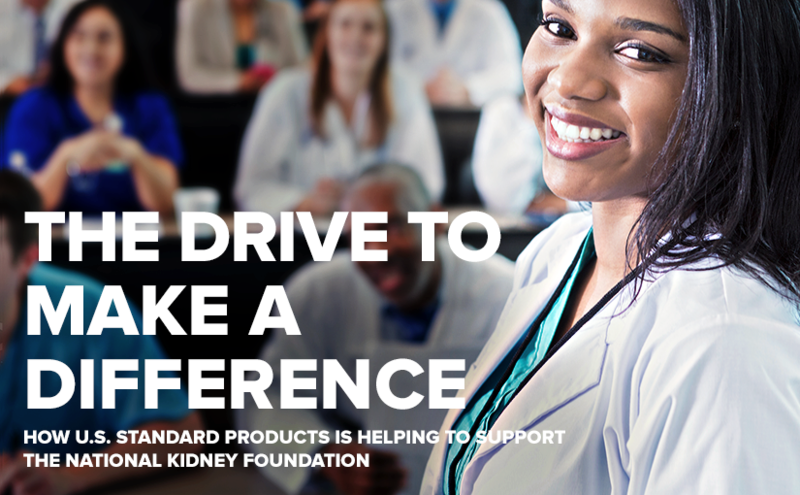 U.S. Standard Products is proud to support the National Kidney Foundation serving Greater New York. Through our support of the Grand Rounds program, the organization is able to improve awareness, prevention and treatment of kidney disease. All healthcare professionals are required to participate in a set amount of professional development in order to retain their licensure. Medical Grand Rounds are professional development events, hosted in hospitals, to help physicians and staff fulfill that requirement and stay informed of the most cutting-edge research, knowledge and industry advancements. The number of attendees ranges from 50-150 medical practitioners. The National Kidney Foundation leads 10-12 Grand Rounds per year across New York and New Jersey. The organization focuses on presenting Grand Rounds in underserved areas and hospitals that serve many patients with diabetes and hypertension, the two leading causes of kidney failure. At each event, the National Kidney Foundation brings in a well-respected thought leader to speak on a kidney health-related topic with an emphasis on nephrology and primary care. The speaker receives an honorarium, which is made possible by U.S. Standard Products’ support of the program. What’s the Impact of Our Support? Studies indicate that early intervention is critical in decreasing the complications associated with progressive kidney disease. Grand Rounds focuses on educating healthcare practitioners on the timely identification and treatment of chronic kidney disease (CKD) and on the link between cardiovascular disease (CVD), diabetes and CKD. Beyond that, the ultimate goal of the speaking event is to inspire a change in practice and transform the way that care is delivered. The National Kidney Foundation (NKF) is the leading organization in the United States dedicated to the awareness, prevention and treatment of kidney disease for hundreds of thousands of healthcare professionals, millions of patients and their families, and tens of millions of Americans at risk. December is the season of giving, and U.S. Standard Products is no stranger to philanthropy. For every sale that we make, a percentage of our profits goes toward helping our charitable partners reach their missions, all year long. Here’s a look at our charitable partners, and what they’re doing to build an even better world. The Wounded Warrior Project is an organization that provides support for wounded veterans who were and are affected by the military actions following the events of September 11, 2003. Our support for the WWP helps veterans across the country access programs aimed to address the mind, body and economic challenges that many face upon returning home from service. As a proud supporter of the National Kidney Foundation serving Greater New York, U.S. Standard Products is helping to prevent kidney and urinary tract diseases across the globe. Recently we sponsored a program entitled “A Primary Care Approach to CKD Management” to help spread awareness and education on the topic. We also sponsor the Medical Grand Rounds program at underserved hospitals throughout New York and New Jersey. Business Professionals of America is a career and technical student organization with 43,000 members across the country that provides preparation of a world-class workforce. Our support helps to facilitate scholarships, educational resources, professional development workshops, webinars and other opportunities for students (middle school through college) who are interested in pursuing careers in business management and related fields. A prominent environmental organization, the Sierra Club is dedicated to protecting the wilderness and promoting a clean energy economy. By supporting this organization and its mission in combination with the sale of our eco-friendly products, U.S. Standard Products is helping to make the world a cleaner, more sustainable environment for us to live in. As a member and supporter of the Greater Ft. Lauderdale Chamber of Commerce, we help to empower businesses in the South Florida area to be the best they can be though programs, services and networking opportunities.